ample COVERED PARKING and ONSITE LAUNDRY facilities. CAN OPENER, COOKWARE, SILVERWARE, GLASSES, TOWELS and LINENS. Central AIR CONDITIONING. CEILING FANS in dining area and bedroom. COZY outdoor PATIO area with table and chairs. 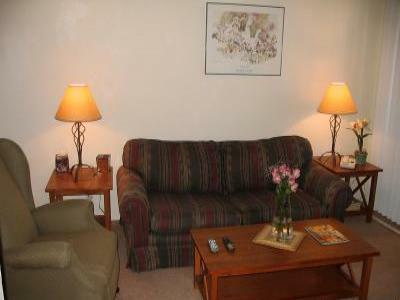 all utilities; basic cable and local phone included.